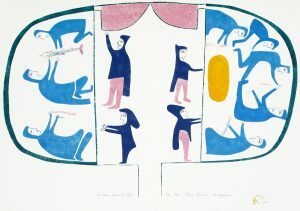 Jessie Oonark is one of the most iconic Inuit artists of the twentieth century. 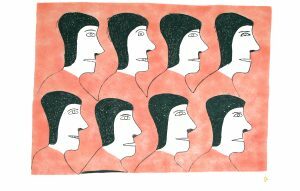 Her strong, bold and colourful compositions that have delighted generations found their expression in various media, including drawings, prints and wall-hangings. Like many of her contemporaries, Oonark and her family left their traditional life on the land to move into the settlement of Qamani’tuaq (Baker Lake) in the late 1950s. Her talent was immediately recognized and a succession of art advisors in Qamani’tuaq (Baker Lake) provided materials and encouragement. She began drawing, creating strong symmetrical compositions peopled by figures in traditional clothing, animals and birds and stylized versions of traditional tools and implements. Her strong, symmetrical style translated perfectly into textile art as she began to create exquisite appliqués and embroidered wall-hangings. Her talent, devotion and hard work were important to the development of the graphic arts programme in Qamani’tuaq (Baker Lake). 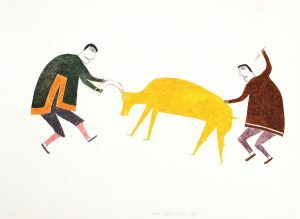 In addition to her inclusion in annual Baker Lake Print Collections, three of her prints were released through the Cape Dorset Studio in 1960 and 1961. 1986 Retrospective Exhibition with publication held at Winnipeg Art Gallery. 1984 Recipient of a Women’s Caucus for Art Award in Toronto. 1977 Travelled to Charlottetown, P.E.I. to attend a conference of the Canadian Crafts Council, during which Oonark was made an honorary member. 1976 In Ottawa to attend the presentation of the Sunday Missal of the Roman Catholic Church, which contains an illustration by Oonark. Missal published by the Canadian Catholic Council of Bishops. 1976 Created an original design for first day cover and cachet print (edition of 1,000) for a United Nations stamp honouring the Habitat Conference in Vancouver; travelled to New York and autographed covers. Original drawing purchased by National Museum of Civilization, Ottawa. 1975 Elected a member of the Royal Canadian Academy of Arts. 1973 Commissioned to make a wall hanging for the lobby of the National Art Centre, Ottawa. 1973 A wall hanging made by Oonark was presented to H.R.H. Queen Elizabeth on behalf of the Inuit of the Northwest Territories. 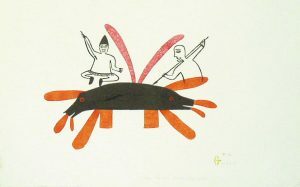 1972 Illustrated “I Breathed a New Song”, an anthology of Inuit Poetry edited by Richard Lewis. 1969 Large applique wall hanging originally presented to the Northwest Territories Legislative Assembly, now a permanent feature of the Assembly’s Chamber in Yellowknife.